India is the second largest smartphone market and every maker wants a piece of that pie. So, analysts are tracking it carefully, but their numbers differ. 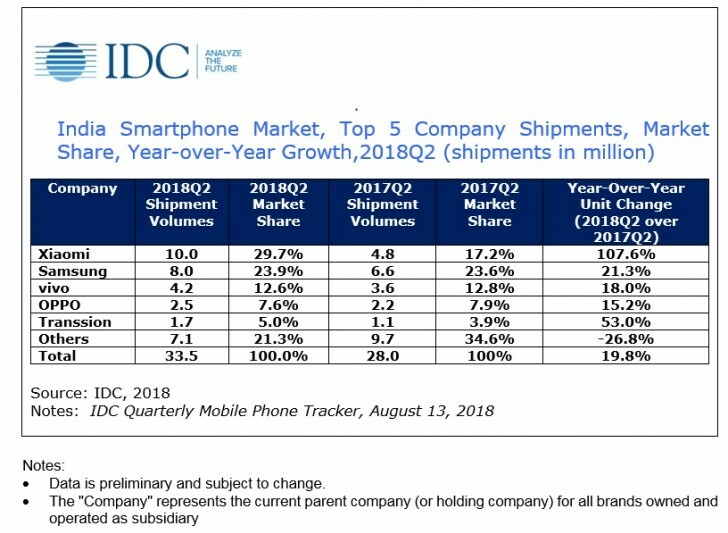 The latest to chime in is IDC and its data shows that Xiaomi has a larger lead than other analysts have suggested. Xiaomi took a 29.7% share of the Q2 shipments with 10 million units. In contrast, Samsung shipped only 8 million units for a 23.9% of the market. While the numbers from Canalys and Counterpoint agree on the Xiaomi numbers, the Samsung numbers are off. 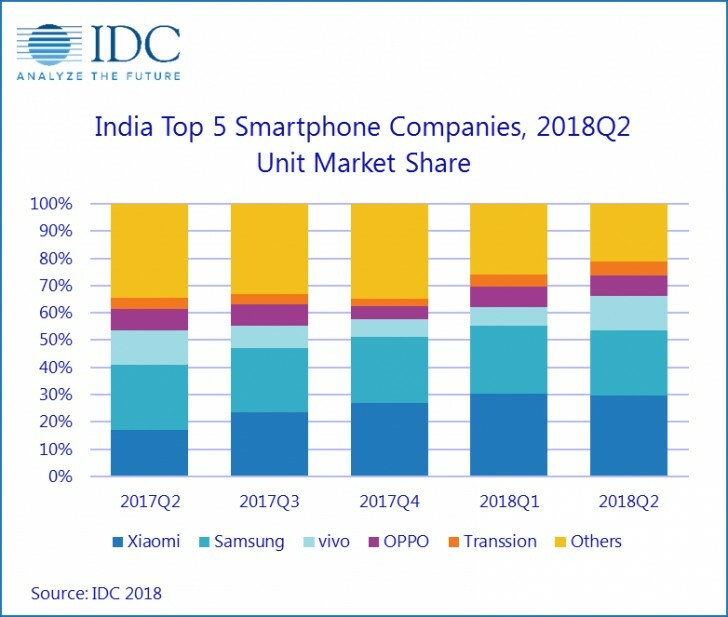 And not just them – going by IDC data, Oppo’s market is smaller and that contributes to the difference, at least in part. Similarly, Huawei is bumped off the Top 5 list and Transsion took its place with a solid 5% share. Transsion is behind the brands Tecno, Itel and Infinix, so it maybe shouldn’t be counted as a single entity (otherwise vivo and Oppo should be together under the BBK banner). Counterpoint counts Itel (and perhaps the others) as a separate brand). Anyway, Xiaomi’s top phones are the usual suspects: Redmi 5 and Redmi 5A, Redmi Note 5 and Redmi Note 5 Pro. Strong sales of those models helped Xiaomi double its Q2 2017 shipments. Samsung’s top performers were the Galaxy J6, J7 Nxt, Galaxy J2 (2018) and its 2017 predecessor. IDC does confirm Counterpoint’s report that OnePlus surpassed Samsung and Apple in the premium market ($500+). As for feature phones, they grew 29% year over year to 44 million units shipped. Jio continues to rule that market. correct MIUI is better than TW on any day...development community of MIUI is huge. ...from personal experience.